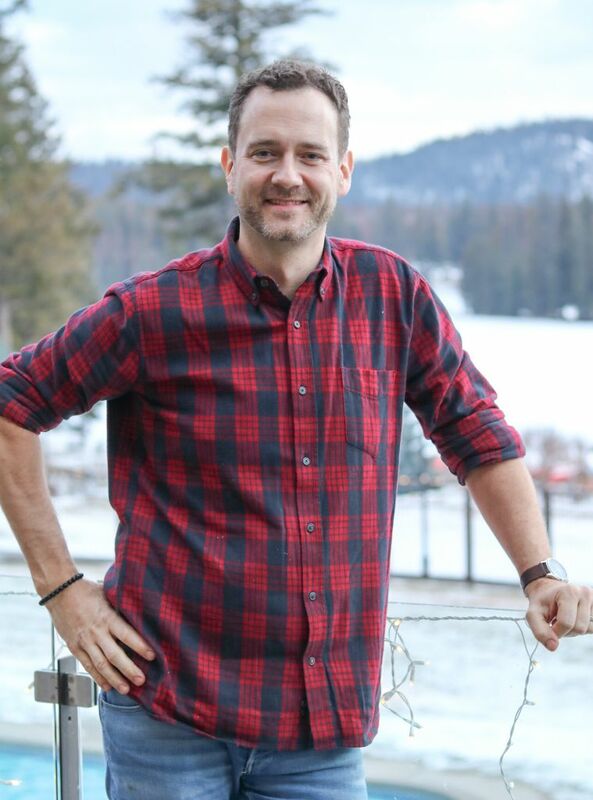 At this year’s Christmas in November at the Fairmont Jasper Park Lodge, celebrity chef Corbin Tomaszeski was all about teaching others to have fun in the kitchen. His culinary sessions included everything from sabering champagne bottles to having his kitchen helpers on stage (like my friend Abe) gobble like a turkey every time he said “turkey” while sharing his recipe for spiced turkey sliders. Beyond the giggles and entertainment in his Taste Alberta sponsored cooking demos and fireside chats, chef Corbin had a message to share about ingredients, cooking food, and eating a meal. It was a simple concept, and one that Corbin experienced throughout his childhood growing up on a farm in Alberta. Through his first-ever cookbook – In Good Company: Easy Recipes for Everyday Gatherings – Corbin hopes to inspire others to share homemade food together with friends and family. I sat down with Corbin during Christmas in November at the Fairmont JPL to learn more about his farming roots and what motivated him to write his first cookbook. What was your introduction to food growing up on a farm southwest of Edmonton? While I currently live in Toronto, I am very proud to have grown up on a small mixed beef herd farm in rural Alberta. I learned at a very young age if you didn’t plant it, grow it, harvest it, milk it, or pick the eggs, you didn’t eat. I knew where my food came from, but I also learned how food brought people together, especially in a farming community. It was indoctrinated into me that when you cook, people show up; cooking brings people together and builds community. My mom had six kids and two adults to feed and she tells stories now that we used to eat 50 pounds of potatoes a week. It felt like we grew acres of potatoes on the farm; it helped feed us through the winter. My mother had a beautiful, large garden, and in the fall she always did a lot of canning and preserving. If you could smell the brine when you got off the school bus, you knew she was in stockpile mode. Living in a city, how do you teach your children about where their food comes from? Since I am a chef and I grew up on a farm, I want to make sure my children understand where our food comes from. I take them to farms, I introduce them to farmers, and I explain the ingredients in the dishes we eat. I wanted my children to know that ham isn’t just something sliced at the deli in the grocery store – ham comes from a pig. Why is teaching your children about food so important to you? For me, food is a reason why we gather. I don’t want the next generation to forget about our farmers, or the art of cooking. And that starts with understanding food, where it comes from, and why we should appreciate it. I love driving across the prairies and seeing fields of yellow canola. Something that is so iconically Canadian is also a story opener to educate my children. I can explain how they these beautiful fields are harvested for a seed which is used to crush oil, and how that oil was used for the chicken we fried, or as an ingredient in the banana bread we ate last week. It is my job to explain how that bright yellow field becomes a jug of canola oil in the pantry. What made you finally write your first cookbook? I felt like it was finally time to share my story. I also wanted to teach my children; I wanted to share why we need to cook, why we need to gather, and why we should be taking advantage of high-quality, seasonal ingredients from local farmers, producers, and suppliers. How did you decide which recipes made this book? I wanted to share where I came from, the people behind where the recipes come from, and give people a book of simple, can-do recipes that creates offerings throughout the year. This book includes a lot of farmhouse staples featuring a number of ingredients I grew up on like beans, chickpeas, chicken, eggs and milk. Canada, and Alberta especially, has some of the best producers in the world. I don’t want people to lose sight of what is in our own back yard – I wanted to keep the recipes simple with ingredients that are accessible. Why do you want to inspire people to cook together and eat together? Growing up on a farm, we had to work hard to make sure we had enough to eat. Today, food has become instant; we can order just about anything to our door. Food is over abundant and we import things that aren’t seasonal. We know there is always more to buy, which has leads to food waste. I truly believe if we bought less, but but higher quality ingredients and food, we would be happier and healthier. We’ve lost the art of cooking and the value of food. I want to inspire people to understand where their food comes from, to support the incredible farmers and producers across Canada, and reap the benefits of spending time in the kitchen. Cooking is becoming cool again, and I’m excited to hear that Canadians are reinventing the art of sunday suppers. I want to inspire people of all ages to start cooking together – its a great vehicle to learn about food and where it comes from. When working with ground meat, it’s important to understand that more fat means more flavour. Because turkey is very lean, you need to consider ways of adding fat (like the lemon mayonnaise in this recipe) to brighten up the meal. To make the turkey patties, in a medium bowl, combine all ingredients except for the oil and cilantro. Mix well. Evenly divide the mixture into eight. Shape the patties about 3 inches in diameter. Heat a grill pan over medium heat or pre-heat the BBQ to 350F. Lightly oil the grill pan or BBQ grates with oil. Place patties in grill pan or BBQ and cook for 5 minutes. Flip and cook for another 4-5 minutes, until juices run clear and internal temperature reaches 165F. Transfer patties to a serving platter. Season with salt and pepper. Set aside to rest for 4 minutes. Place a small dollop of lemon mayonnaise on each patty. Garnish with a sprig of cilantro and serve. To make the lemon mayonnaise, in a small bowl, combine all ingredients. Mix well and set aside.